Eight years after it split up, pop trio Destiny’s Child (Beyoncé, Kelly Rowland, and Michelle Williams), is back. Oh, Destiny’s Child! You can’t fool us for long! DC-3 member Michelle Williams might’ve tried to convince us last week that a reunion for the group at the Super Bowl was just NOT happening, but we’re so onto them! While no official announcement has been made, we’ve been hearing all sorts of reports about the reunion and even a rumored set list! 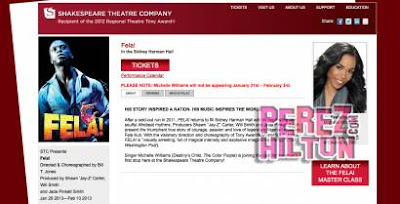 Michelle, who is currently starring in the musical, Fela!, reportedly will NOT be performing in the play from January 31st to February 3rd, or so the theater’s website states (below)! February 3rd, of course, IS the date of the Super Bowl in New Orleans… and we’d have to go and assume that she’d be in rehearsals with Kelly and Beyoncé those days before! We’re going to go ahead and get our hopes up — after all, every rumor starts somewhere! LOLz! Destiny's Child — you in the house? Throw your hands up at me!